Andrew and his wife Susan have five children. 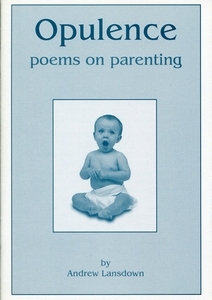 The poems in this short collection celebrate parenthood, concentrating on the early life of one of their sons. Andrew’s poetry has been published in over sixty magazines/newspapers and forty anthologies. His third collection of poetry, Windfalls (published by Fremantle Arts Centre Press in 1984), won the Western Australian Week Literary Award (now the WA Premier’s Award). His sixth collection, Between Glances (published by William Heinemann Australia in 1993), won the Adelaide Festival’s John Bray National Poetry Award..
but our son still sleeps. his hot mouth to squall. as a breast with milk.